Caroline was born in Southampton, England, to musical parents. 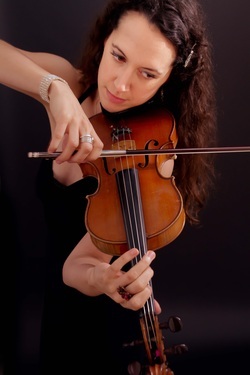 She studied at the Birmingham Conservatoire with Philippe Graffin, Peter Thomas (CBSO), David Angel (Maggini Quartet) and Rohan de Sarum (Arditti Quartet). She received her BMus(Hons) degree and a Postgraduate Diploma. Her curiosity and fascination with new timbres and techniques on the violin led her to working with the contemporary music groups Ensemble Multilaterale, Ensemble Alma Viva (with guitarist Pablo Marquez) and Ars Nova. In 2006 she won a bursary from the Stephen Arlen Memorial Award to go to Buenos Aires to the International Tango Festival, where she took lessons with famous tango violinists like Pablo Agri, Ramiro Gallo, Leonardo Ferreira and Mauricio Marcelli. She was very inspired by their musical ideas and the rhythm of life in the big capital. Having always had a profound love for string quartets, she created the group The Firebyrd String Quartet in 2008 in order to search for new rhythmic sonorities and to write arrangements that explore the relationship between string instruments and more percussive playing. With this quartet she plays tango, folk, funk and some jazz with the singer Victoria Rummler. They recently performed with Canadian singer-songwriter Sarah Sleane. The group has also recorded for Polydor Records. In 2009 she founded the London Tango Orchestra, the first traditional orquesta tipica in the UK, with whom she took part in a BBC documentary about tango music in 2012 and appeared in Mr Selfridge II for ITV. She received a Masters in Ethnomusicology from the Royal Holloway University of London in 2011. In the summer of 2014 she won a Winston Churchill Fellowship to go to Argentina for 2 months to interview tango violinists and musicians to write a book about tango violin. She has made a website of this project that you can see here www.tangoviolin.com. During her time in Buenos Aires she interviewed violinists such as Fernando Suarez Paz, Pablo Agri, Leonardo Ferreyra and performed with the Orquesta Escuela, Orquesta Tipica Adrogue with Jose Colangelo and the Orquesta de Cuerdas Elvino Vardaro with Sexteto Meridonal and Diego Schissi Quintet in the Usina del Arte for the Buenos Aires Tango Festival 2014. She currently continues her interest in classical chamber music with the Arte Musica Trio, and in world music with Laurent Boutros (Armenian music) with concerts in Spain, Italy and France, with TangoLeon playing tango, free jazz improvisation and soundpainting.